We have analysed a significant number of Water Injection Systems since the company was formed and these have varied from FEED stage projects to solving operational problems on existing Platforms / FPSO’s around the world. It is the start-up of the system which often generates transient pressure problems due to the high pump delivery pressures, the high headlosses across relief valves or overboard dump valves and also vibration problems if the booster pumps have a ‘flat’ performance curve. Interaction problems between the booster pumps and main pumps need to be evaluated and, in our opinion this should form an integral part of the study. For example, we were recently asked to investigate unacceptable pressure transients in a WI system on an FPSO which was occurring when a main pump started which in turn caused significant pressure transients in the subsea line when the overboard dump line and relief valves operated. The study will often focus on the control valves and we will optimise the PI control settings, if necessary to avoid any operational problems. 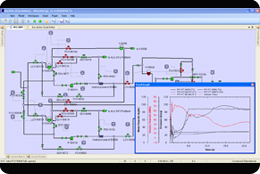 We can model complex dual controllers (such as split range pressure controllers) and, due to the accurate modelling of the change in pipeline wavespeed, an assessment of any vibration or cavitation problems which may occur can be undertaken. In addition to this, we will advise on the required pressure rating of the risers and subsea feed lines based upon closure of the wing valves.